A recent report by Lambert Smith Hampton on the Bristol office market report, reveals that in the final quarter of 2016 transaction levels reaching almost double those of the previous quarter. Take-up reached 267,200 sq ft in Q4 2016, compared with 134,400 sq ft in Q3 2016. Strong demand has led to continued pressure on office supply in the city centre. City centre take-up was boosted by HMRC’s pre-let of 107,000sq ft at Salmon Harvestor’s 3 Glass Wharf, which was the largest Bristol office deal of the year. Total take-up has exceeded the five year average. There were three deals for new office space in Q4 2016: Foot Anstey at 2 Glass Wharf, The West Wing Glass Wharf and JLL at 31 Great George Street. The second-hand city centre office market has also seen increased levels of take-up with several deals of over 10,000 sq ft, including lettings at South Quay House, Redcliff Quay and the purchase of Victoria House for owner occupation. Companies recently signing for space in Bristol and reported by Metropolis included Regus, Unite and SmithCorp. The out of town market saw annual take-up of 308,380 sq ft, including the letting of 100 Bristol Business Park to Babcock.. The other key letting of 30,430 sq ft was to Highway England at 930 Aztec West. Construction of the 95,000 sq ft of Cubex’s Aurora office scheme at Finzels Reach is now well underway, with completion expected by the end of 2017. While the 53,000 sq ft refurbishment at Castleforge’s One Cathedral Square, is due to complete in May 2017. Metropolis is tracking around 40 office requirements in Bristol and some 50 companies approaching lease events that could result in a relocation in 2017 or 2018. The annual London law sector report from Jones Lang LaSalle (JLL) calculates 33 London law firms are looking for office space. This headline figure reinforces research this month by Metropolis which has reported 31 new London law firm requirements so far in 2014. JLL report that although the cost of prime office space is rising to £60 per square foot, the increasing costs and squeeze on available space that the total amount of space from all current London law sector requirements is 871,000 sq ft, of which 372,500 is under offer. In the first three quarters of 2014 have been 14 transactions involving law firms, equating to 400,000 sq ft which is a slight drop on the same time last year. Firms agreeing deals recently have included Macfarlanes, Mishcon de Reya, Howard Kennedy, Davis Polk and Ropes & Gray. JLL have identified a trend for companies to look further ahead. Traditionally law firms would start planning 2-3 years before the end of a lease, but because of an impending development squeeze in London, this could rise to as much as five years. The longer time periods also enable firms to influence fit-out. Looking ahead, Metropolis is discussing future lease expiries with firms such as Dechert (60,000 sq ft), Cleary Gottlieb Steen & Hamilton (60,000 sq ft), Plexus Law (30,000 sq ft) and Mills & Reeve (10,000 sq ft) which could prompt further searches. The Next Big Thing ? 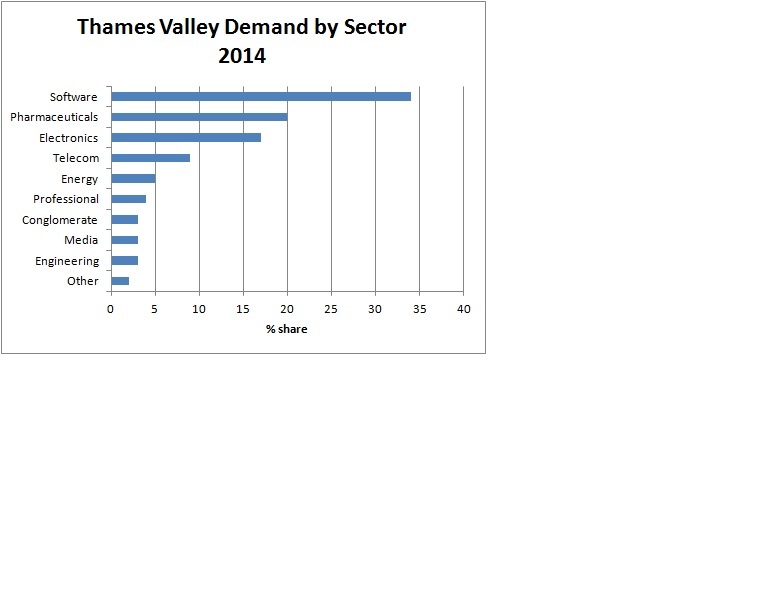 Recent reports from CBRE and Lambert Smith Hampton have highlighted bounceback last year in the volume of office deals in the Thames Valley (broadly West London along the M4 motorway to Swindon, plus parts of the M3 to Basingstoke and west Surrey). The office deals increase saw volume of office floorspace let grow by nearly 60% in 2013 to nearly 2.6m sq ft, compared to 1.6m sq ft in 2012. Agents also report around 3m sq ft of active unfulfilled office demand in the region. Over the past 12 months, Metropolis has reported on more than 150 medium and large office deals in the Thames Valley, totaling around 2m sq ft. Some of the bigger deals just announced include lettings to BMW, Rackspace, Dunnhumby, Nexen, Tesco and PWC. The database currently details over 100 current office requirements, with a wide variety of companies searching for over 2m sq ft in the Thames Valley; including space under offer to companies such as GE Capital, Weightwatchers and Avnet. Followed by Guildford, Woking, Maidenhead, Uxbridge and Staines. All locations provide ready access to Heathrow. In general, technology companies are drawn to Reading and Bracknell, engineering firms show a preference for west London, with conglomerates preferring Surrey. Looking ahead, there is another bulge of office lease expiries approaching between 2015 and 2017, which will cause decisions to be made over the next two years. In addition, the resurgence of the technology sector worldwide has seen a wave of, particularly US and far eastern corporations, establishing European operations with R&D, engineering healthcare, software and robotics at the forefront.